In an attempt to promote breastfeeding and improve breastfeeding rates, campaigns in Ontario are getting creative. Public breastfeeding is something many new mamas feel nervous about. Some women prefer to use a bottle instead of breastfeeding in public. For others, it can play a part in ending their breastfeeding journey. So, how can you help new mamas to feel ok about breastfeeding in public? Easy, normalise breastfeeding. Make it something you see wherever you go. How to do that? Easy, tell more women to breastfeed in public. Oh wait, they don’t want to, that’s the problem. It’s the chicken and the egg of the breastfeeding world. 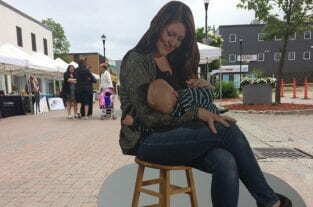 The Porcupine Health Unit in Ontario is using cutouts of breastfeeding mothers to encourage women to breastfeed in public. The life-size cutouts will be displayed at various venues across the city to ignite a conversation about breastfeeding. The cutouts feature local mamas who were photographed feeding their babies. It is hoped the campaign will help to make breastfeeding a normal sight, while also fighting the stigma around public breastfeeding and raise awareness of a woman’s right to breastfeed wherever she likes. While a woman’s right to breastfeed in public is protected by the law, it’s not unheard of for women to be asked to cover up when feeding their baby. Of course, such instances are rare but they do happen, with some women even being asked to feed their babies in the toilet. It’s hoped this campaign will educate the public and business owners and prevent future incidences. The campaign will run for around a month. In an attempt to maximise the campaign’s reach and encourage as many women to breastfeed as possible, the cutouts may be sent to nearby towns once the initial month is over. Confidence can play a key role in whether women choose to breastfeed. Find out how to build your breastfeeding confidence here. Women rely on the support of their partner, friends and family during their early days of breastfeeding but are also reliant on the attitudes of strangers when they breastfeed out and about. Campaigns designed to improve breastfeeding rates not only encourage new mamas to persevere with breastfeeding but potentially help other members of society to feel more comfortable with the sight of breastfeeding women. The campaign is based on a small scale study which took place in Bristol in 2010. Campaigners created four breastfeeding cutouts which were displayed across the city as part of National Breastfeeding Week. According to surveys, a third of respondents felt the campaign had helped them to feel more positively about breastfeeding in public. How would I go about obtaining these cut outs for a campaign in my community?